So, what is fostering anyway? Who can I expect to foster? Will the dog I foster be healthy? Will I have to pay for veterinary expenses? Does a foster get paid? What’s up with all of these out of state rescues? What if I fall in love and want to adopt my foster? What if things aren’t working out with my foster? Dog Bless is based in Charleston (Kanawha Co.), West Virginia. 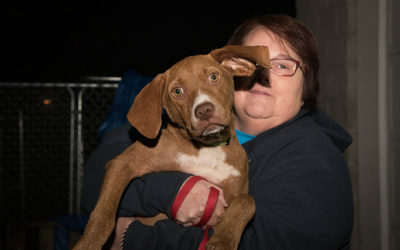 We send Kanawha-Charleston animal shelter dogs to rescue. Fostering is the #1 most important aspect of rescue. By agreeing to foster a dog on its way to rescue, you take care of that pet as if it were your own. You will provide love and attention, adequate exercise, food and shelter. Though the duration of foster care varies across organizations, Dog Bless fosters are only temporary. 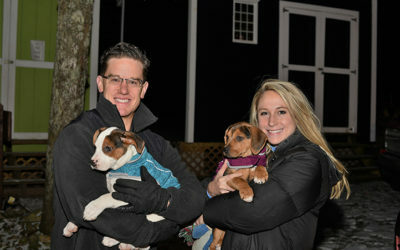 All dogs placed into foster care through Dog Bless have been “pulled” (the rescue term for “adopted”) by rescue, meaning they have a place to go very soon. Foster duration through Dog Bless averages 2 to 3 weeks. Because Dog Bless was formed to promote rescue efforts at KCHA, all pets placed into foster care will be former shelter pets. Just like shelter pets, foster dogs come in all shapes, sizes and breeds (or not). Because fostering is voluntary, fosters are never required to care for animals out of their comfort zone. You may specify your interests on our volunteer application. Dog Bless requires our fosters to complete a volunteer application in its entirety. Fosters must pass a vet reference check, and their own pets must be fully vaccinated. Often, shelter pets have Kennel Cough or other similar illnesses and vaccinations help to protect everyone in the foster home. Dog Bless requires our pets be restrained (within a fence or leash walked) when outdoors – no pets may run “loose” while in foster care. Pets must be kept indoors while you are away. Exceptions may be made in rare circumstances. Though it is not a requirement, we highly recommend crating your foster while you are away. Dog Bless will not be liable for any damage caused by dogs in your care. As is common in shelter dogs, nearly every dog we pull will have kennel cough. This is to be expected. If you are unfamiliar with kennel cough, it is comparable to a cold in humans – highly contagious yet easily treatable. Antibiotics will be provided as necessary. Refusing to foster a dog with kennel cough will greatly reduce your chance of fostering, and also our ability to pull dogs for rescue. A:As a volunteer, you will not be responsible for veterinary charges associated with the rescue of your foster. To the extent that your foster pet may require additional veterinary services or medications, Dog Bless will request authorization from its receiving rescue and arrange payment for such services. A foster should never authorize treatment without first seeking the rescue’s approval. No. Fostering is strictly voluntary. But if you’re an animal lover, the reward one feels from fostering is immeasurable. It’s hard to imagine, but not all states suffer from the pet overpopulation problem that West Virginia does. Many states, particularly in the northeast, are considered dog-poor. Our dogs are highly coveted in markets such as these. Many are adopted within hours of arriving at rescue. A “foster failure” is known as someone who adopts their foster dog, in essence “failing” as a foster. Dog Bless understands falling in love with your foster dog is easy, but letting them go isn’t. Though we are sympathetic to our fosters’ desire to adopt, dogs in foster care through Dog Bless are no longer available for local adoption. Though adopting your foster may seem harmless, our organization and our credibility would be compromised by not completing rescues as planned. Agreeing to foster is a commitment. 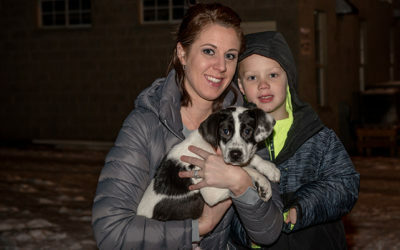 When you agree to foster, your willingness to do so allows Dog Bless volunteers the opportunity to begin seeking a foster home for the next dog going to rescue. Though we try our best to place each dog in a foster home that will fits its lifestyle, that’s not always realistic due to the volume of dogs we pull. We would kindly ask that if you agree to foster a dog that you keep your commitment and see it through. Relinquishing your foster creates additional work on our already overloaded volunteers.